We carry rolls and bolsters in this category which are irreplaceable for a balanced yoga. They support, relieve, give support and prevent injury. Yoga rolls and yoga bolsters are practical aids which continually gain importance in Pilates as well. Due to their different forms, they can be used in manifold ways and offer optimal support in many asanas and Pilates exercises. But these aids can also be well used in phases of relaxation. 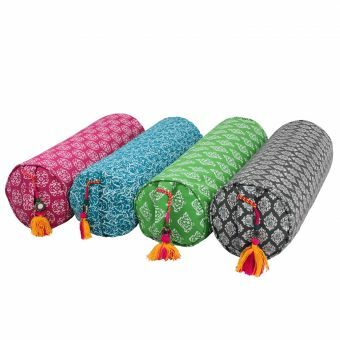 You can use the Yoga bolster both for stretching the ribcage for better breathing and for comfortable sitting. The soft, long yoga roll is well-suited especially for taller people to stretch the ribcage. The Yoga-roll supports you strengthening the muscles in your Yoga- and Pilates practice. The filling materials, whether spelt or buckwheat, snuggle gently to the body. 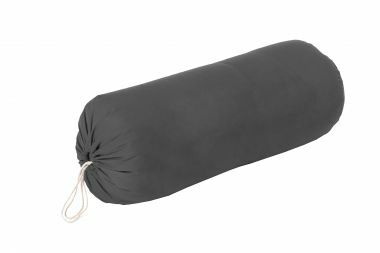 Due to the spelt filling, the yoga bolster seems rather firm, whereas the cotton filling makes it rather pleasantly soft. Most Yoga aids can be transported very well with the strap.